Like most women, Julie de Azevedo Hanks wears many hats, loves eating chocolate, taking long naps, and she tolerates exercise. 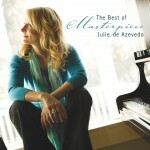 She is an award-winning performing songwriter, Julie’s most recent CD “Masterpiece: The Best of Julie de Azevedo” is a collection of her best-loved songs. Her most valuable experience has been “in the trenches” of family life for nearly 24 years as wife and mother of 4 children ranging from kindergartner to college student. As a licensed therapist Julie has been counseling women, couples, and families for nearly 2 decades. In addition to providing therapy and serving as Executive Director of Utah’s Wasatch Family Therapy, Hanks is a sought after media contributor appearing regularly on KSL TV’s Studio 5, and has appeared on TLC, Discovery Health, and Fox News Channel. Her down-to-earth advice has been featured in The Wall Street Journal, Cosmopolitan, Women’s Day, Women’s Health, Parenting, and others. Julie first book written for women of faith about the importance preventing emotional burnout through emotional self-care is scheduled to publish in Aug. 2013. She hosts a weekly radio show “The Julie Hanks Show” on BYU Radio where she talks with callers and offers help with their life challenges. Over the past 25 years, Julie de Azevedo has written, produced, and performed some of the most popular songs in the LDS music industry. Masterpiece: The Best of Julie de Azevedo is a must-have collection highlighting the best of the best.